Simon & Schuster, 9781451658972, 336pp. A genius immortalized her. A French king paid a fortune for her. An emperor coveted her. Every year more than nine million visitors trek to view her portrait in the Louvre. Yet while everyone recognizes her smile, hardly anyone knows her story. “Combining history, whimsical biography, personal travelogue, and love letter to Italy...Mona Lisa is an entertaining” (Publishers Weekly) book of discovery about the world’s most recognized face. Who was she? Why did the most renowned painter of her time choose her as his model? What became of her? And why does her smile enchant us still? Dianne Hales, author of La Bella Lingua, became obsessed with finding the real Mona Lisa on repeated trips to Florence. In Mona Lisa: A Life Discovered, she takes readers with her to meet Lisa’s descendants; uncover her family’s long and colorful history; and explore the neighborhoods where she lived as a girl, a wife, and a mother. In the process, we can participate in Lisa’s daily rituals; understand her personal relationships; and see, hear, smell, and taste “her” Florence. Hales brings to life a time poised between the medieval and the modern, a vibrant city bursting into fullest bloom, and a culture that redefined the possibilities of man—and of woman. Mona Lisa is “a readable and affectionate my-search-for-story for art lovers and anyone interested in glorious and gory Florence in the fifteenth to sixteenth centuries, and in the divine Leonardo in particular…Hales’s assiduous research has made it possible for us to know Mona Lisa just a bit, enough to wonder if this otherwise ordinary Florentine housewife could ever have imagined her portrait enchanting millions for centuries” (USATODAY.com). Dianne Hales is a prize-winning, widely published journalist and author. The President of Italy awarded her an honorary knighthood in recognition of her bestselling book, La Bella Lingua. Her other works include Just Like a Woman; Caring for the Mind; and the leading college health textbook, An Invitation to Health. She has served as a contributing editor for Parade, Ladies Home Journal, Working Mother, and American Health and has written for many national publications, including Family Circle, Good Housekeeping, The New York Times, and Woman’s Day. She lives with her family in the San Francisco Bay area. 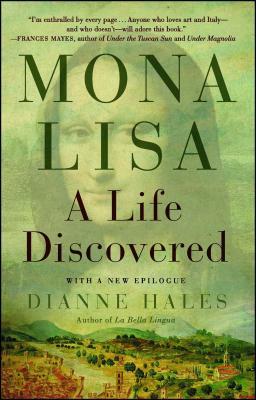 "I’m enthralled by every page of Dianne Hales’s Mona Lisa. The mysteries of the painting remain, but through Hales’s portraits of the people and her skilled rendering of customs, politics, and daily habits of the time, you come to know the painting in profound new ways. The great pleasure of her prose brings Lisa Gheradini’s world to vivid life. Anyone who loves art and Italy—and who doesn’t—will adore this book. "This is cultural history that reads like a detective novel as Dianne Hales tracks down the real woman behind one of the world’s most famous and enigmatic faces. Expertly sleuthing her way through the treasure troves of archives and palazzos, she offers her own fascinating portrait not just of Lisa Gherardini but also of the vibrant Renaissance world that nurtured both Lisa and Leonardo’s painting." "Biography, history, and memoir are woven together in Hales' lyrical biography of Lisa Gherardini...her quest endows human subjectivity to one of art history's greatest icons." "Engaging...a rich tapestry of family life, mercantile society, politics, and artistic development...enthralling." "Veteran journalist Dianne Hales shares with us the tumultuous lives of both Gherardini and the artist who immortalized her, and brings us along on the travels of a work of art for which love and esteem have increased markedly over the centuries." "Combining history, whimsical biography, personal travelogue, and love letter to Italy...an accessible, vivid examination of women's lives in Florence of the period....Entertaining." "It's a joy to follow Dianne Hales' fascinating exploration into what's behind the world's most famous smile—an enchanting mix of fascinating history and passion-filled memoir."